From the odd way that gun is held I assume Oleg didn’t make the photo. In other respects it looks a bit like his work. I did searches on his website and did a quick view of several hundred photos to see if I could find it in his collection. I gave up without searching all of them. It might be there. However, I do appreciate this image focusing on politicians. Overstated? Possibly, but in many cases not by much. Just my opinion. I like the phrase…a government that wants to disarm you, intends to harm you. 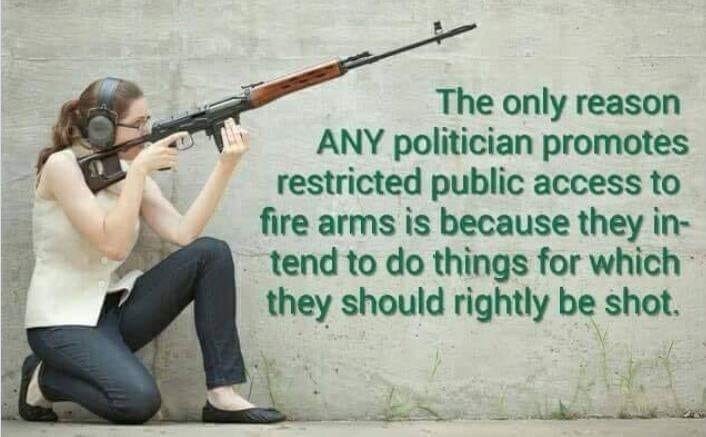 You can entirely determine the suitability of a politician by their stance on the Second Amendment. If they cannot trust you with a firearm, they are not going to trust you with your freedom of speech and so forth. I can make a case for stupidity, and/or ignorance, and/or getting votes from useful idiots. Stupidity, ignorance and useful idiots, certainly. Those are very useful traits for the dark side, but the impetus, that which manipulates and takes advantage of those traits, is as described in the poster. “ANY politician” could be replaced with “political class leaders” or some such then. Every movement or organization has it’s leaders and it’s followers. Similar to a military unit, or rather in fact being one, the followers of the political generals may indeed have no idea what the generals’ are thinking. Oftentimes, keeping the followers ignorant is a key component of the operation. Sun Tzu stressed the importance of keeping the troops ignorant. So it all depends on the degree one has achieved in the fraternal hierarchy of satan, but the generals and the useful idiot followers alike (perpetrators and duped) are your enemies, working in concert for your destruction. Figuratively (or metaphorically) speaking then; the poor, ignorant dupe driving the car full of explosives onto your property (or the politician supporting a new gun restriction) may not necessarily even be aware that he’s carrying explosives on a suicide mission of mass murder. He may have been told that he’s going in to bring food and medicine to your children (or making the world safer by passing a law to get guns “out of the hands of criminals”), but he will nevertheless kill you and everyone present. He’s still a deadly enemy so long as he’s under the control of his fraternity. We can sort out the level of each individual’s knowing and willing complicity at their trials. Some no doubt are made to feel coerced into doing evil, that they have no choice, that it’s too late for them or they’re in too deep, etc. It’s a common enough tactic among street gangs. Surely it’s even more common in global politics and “religious” organizations. I’d offer that only if it’s suggested as a prophylactic measure might it be overstated. Although, under some cicumstances, I’d be open to listening to discussion on the topic.